Irvine Scientific, a worldwide leader in cell culture media development and manufacturing, today announced the introduction of PRIME-XV® T Cell CDM, the first commercially available chemically-defined, animal component-free medium for T cell culture. The new medium has been developed to maximize consistent growth of T cells while maintaining their functionality and therapeutic potential. An increasingly important trend in cell culture media for gene therapies and immunotherapies is the move away from animal-derived and undefined components to serum-free, animal component-free and chemically-defined culture conditions. When working with T cells the advantage of this is two-fold: animal-derived components are variable between lots; and the naturally occurring cytokines and growth factors in them can result in undesirable effects. For example, cytokines and growth factors have been shown to impact growth, phenotype and the potential of T cells to polarize into therapeutic subtypes. 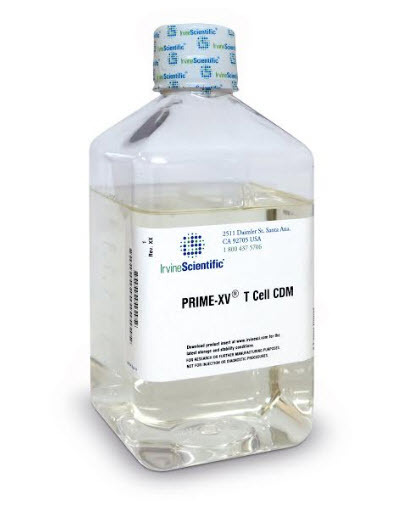 PRIME-XV T Cell CDM removes this variability to provide more consistency between lots. Chemically-defined media also reduces the risk of introducing foreign agents or impurities from undefined components, thereby facilitating scale-up to commercial production and the regulatory submission process. “The ability to produce sufficient quantities and targeted subtypes of T cells is critical to the success of cell-based immunotherapies and gene therapies. In development of this medium, performance was significantly improved by removal of undefined components therefore allowing us to design and conduct development work under defined conditions. Our understanding of T cell biology and the factors that affect growth, viability and phenotype have enabled us to provide the first, fully chemically-defined, animal component-free medium to help scientists advance immunotherapy research towards clinical applications.” said Dr. Jessie H.-T. Ni. Chief Scientific Officer at Irvine Scientific. PRIME-XV T Cell CDM is the ideal complement to BalanCD® HEK293 system. Introduced earlier this year, BalanCD HEK293 is a chemically-defined, animal component-free medium for the production of the viral vectors used to genetically modify T cells for gene therapy and immunotherapy. All products are manufactured using stringent raw material qualification and under Current Good Manufacturing Practices (cGMP) for consistency and reliability.